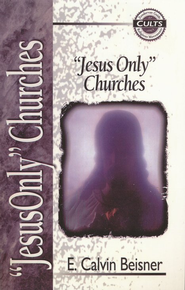 E. Calvin Beisner, Series Editor Alan W. Gomes, "Jesus Only" Churches, Zondervan, 1998, 96pp. "Jesus Only" Churches is part of a fifteen volume series entitled The Zondervan Guide to Cults and Religious Movements, which published from 1995 through 1998, seeks to document and respond to some of the most prominent world religions and cults facing historic orthodox Christianity. Perhaps you might ask, "After so many years, why a review of this volume?" The answer is two fold: The material present in this book is still highly relevant, and the format in which the material is covered makes "Jesus Only" Churches a useful reference tool. Beisner is best known for his work with the Cornwall Alliance for the Stewardship of Creation, a biblical worldview ministry. However, in 1985 he and the late Dr. Walter Martin were participants in the oft cited discussion/debate with Oneness Pentecostal leaders Robert Sabin and Nathaniel Urshan. Perhaps this is what lead Alan Gomes to choose Beisner to write "Jesus Only" Churches. Whatever the reason, Beisner was an excellent choice, as he has produced and outstanding resource that has stood the test of time. The format of the book is unique in that it is comprised of five clearly labeled sections; Introduction, Theology, Witnessing Tips, Bibliography, and Comparison Chart. Each section contains a subsection which presents a particular area of importance pertaining to its heading. For example, the Introduction section includes subsections entitled "Historical Background," and "Vital Statistics." The Historical Background section provides a brief synopsis of the origin of Oneness Pentecostalism, and even its schisms. The Vital Statistics section is perhaps the most out-of-date material in the book, since it provides a list of denominations, their constituency, and their para-church organizations. Most valuable within this work is Beisner's exposition on the theology of the movement and his apologetic response. He deals honestly with primary sources in a concise and scholarly manor. His refutations are equally concise and easy to apprehend. While I certainly don't affirm every detail of his apologetic, especially in light of more modern treatments of certain subjects, overall Beisner's treatment is spot-on. For anyone who is interested in a primer to familiarize themselves with the movement and is seeking for a sound biblical defense of historic Christianity, "Jesus Only" Churches remains a desirable resource. 1. Beisner's numbers were considerably low even for the time of publishing. His projection that, "Oneness Pentecostalism is expected to grow to about 1,513,000 members by A.D. 2000" (p. 9), is not at all accurate- then or now.